The 7′ Adrenaline™ slide is the tallest Inter-Fab slide in its class, FUN-sized, and packed with features to make it one of the most entertaining water slides on the market! From the long 16’8″ runway length to the patent pending Pre-Launch Splash Zone™… riders will feel like they are at the water park and will be entertained for hours! The 6’ Wild Ride™ slide offers up a fantastic thrill ride for the most discriminating of sliders. The Zoom Flume™ water delivery system supplies a rush of water to give you that water park-like ride right in your own backyard! The 6’ G-Force 2™ slide packs a thrilling 360˚ ride that brings the amusement park excitement home to your own backyard. The Zoom Flume™ water delivery system is the best water delivery system in the industry to provide the best slide ride you can get! This slide is available in a 360˚ configuration. 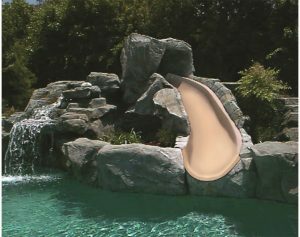 The 6’ X-Stream 2™ pool slide boasts an exhilarating 2-turn ride that will impress all of the kids in the neighborhood. The Zoom Flume™ water delivery system supplies loads of water as you experience the excitement of this high banking, high splash ride! This slide assembles in either a right or left turn configuration. 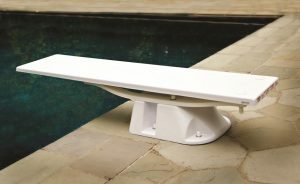 We revolutionized the diving board with our T7™ Diving System by bringing more style and functionality to the product category. 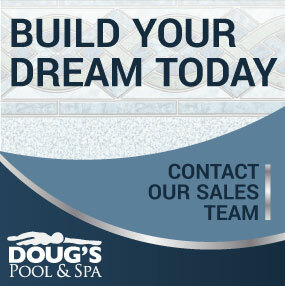 We are the only manufacturer to offer a tip-end waterfall options on a diving board set up, and the response has been overwhelming! The T7™ Diving System is available in 10 beautiful colors including 7 irresistible granite colors. 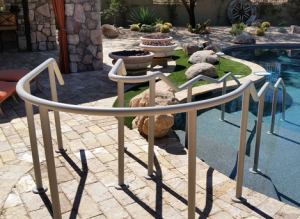 Inter-Fab’s patent pending Designer Series Rails are the stylish alternative to traditional pool rails … “Form Follows Function” so Designer Rails are true to the function of the traditional rail. For easy replacement Designer Series Rails are configured to fit anchor sockets of traditional rails. Designer Series Rails can be upgraded in 6 elegant powder coat colors and 3 Thermo Plastic Coated (TPC) colors. 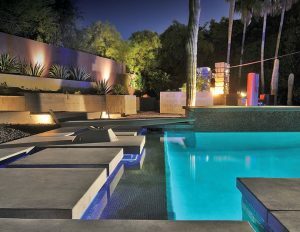 For salt pools … a Marine Grade 316 L stainless steel option is also available. Don’t see a rail that will work for you? No problem, we can design a custom rail to fit your exact specifications. All of our rails are available in standard stainless steel or can be upgraded to one of 6 custom powder coat colors, or 3 thermo plastic colors.